Organizations that require secure, compliant, auditable and reliable business critical communications depend on fax. - in fact, millions of business critical documents are faxed every day. An effective Fax over IP, (FoIP) solution leverages IP network resources and unified communications to help speed investment returns on IP equipment and VoIP applications. 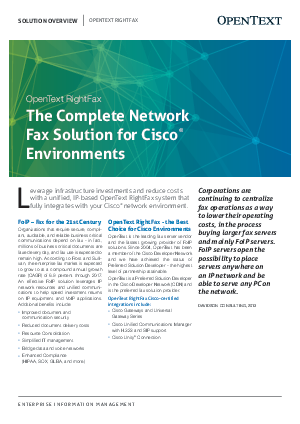 OpenText RightFax is the best fax server choice from Cisco environments providing integration with Cisco Gateways and Universal gateway Series, Cisco Unified Communications Manager and Cisco Unity Connection.